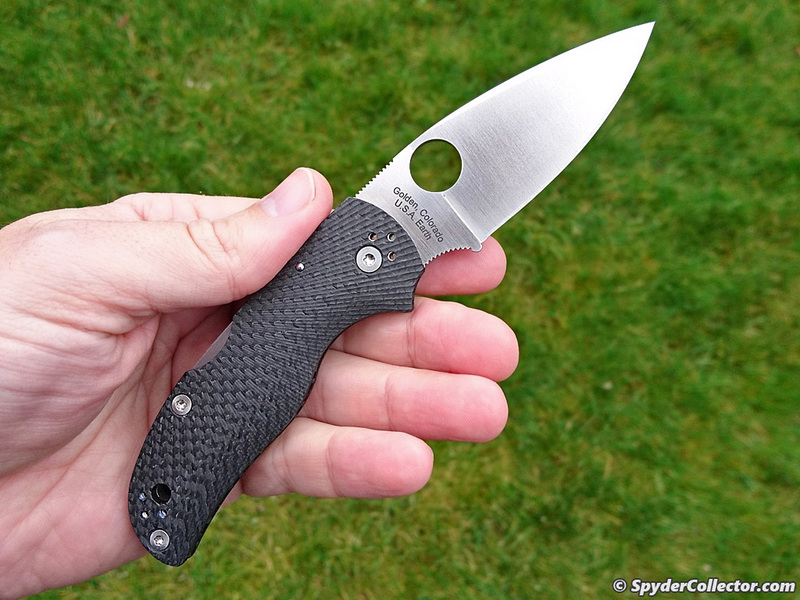 I really like the Spyderco 40th anniversary Native 5, but I know I’ll never ‘hard use’ that knife (whatever that means these days). When this very same knife in a S90V blade was announced, I took notice. 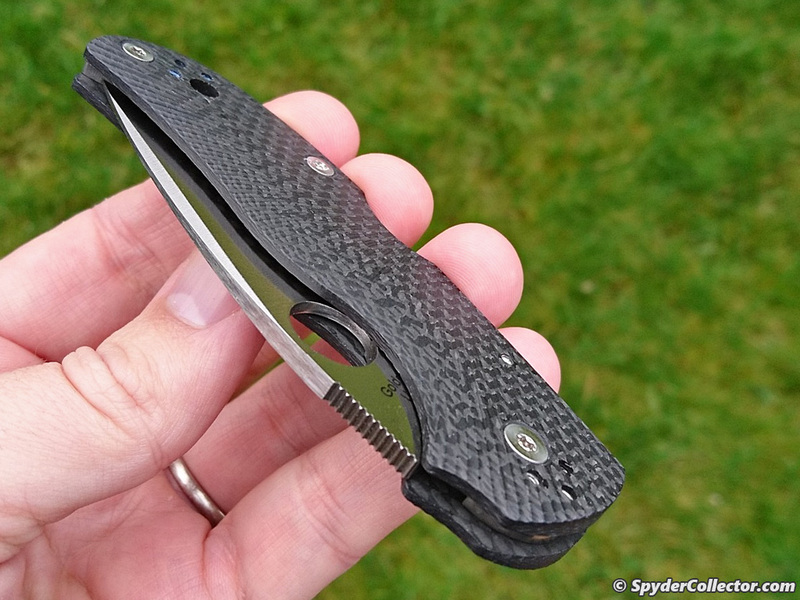 This new C41CFF5 could be a neat companion piece to my anniversary knife, one that I actually would use a lot easier. It turns out that I liked this ‘plain’ Native a lot more than just something to have on me to prevent scratching that beautiful Odin’s eye Damascus steel of the anniversary Native. This knife’s main draw, for me, is that gorgeous fluted handle. I really like its backstory, or what snippets I picked up from it. 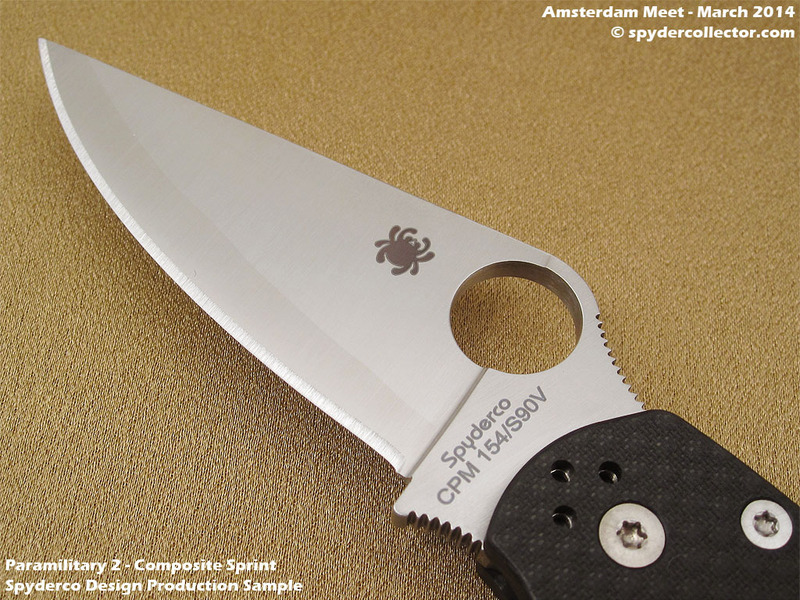 Spyderco has been working on fluted handles for years, way before the C41CFF5 was conceived. The fluted titanium Military was the first knife to come out in 2011 and the handle finish and lock were tweaked several times during production. The fluted titanium Native 5 won American Made Knife of the Year at the 2011 Blade Show, but didn’t become available until 2013. Both knives were dropped from production in 2017. Sure it’s a respectable run, but the fluted titanium knives was always only available in small quantities. Was that because of a lack of interest? Nope. Apparently, they were just extremely difficult to make, in a consistent quality and on a production scale. 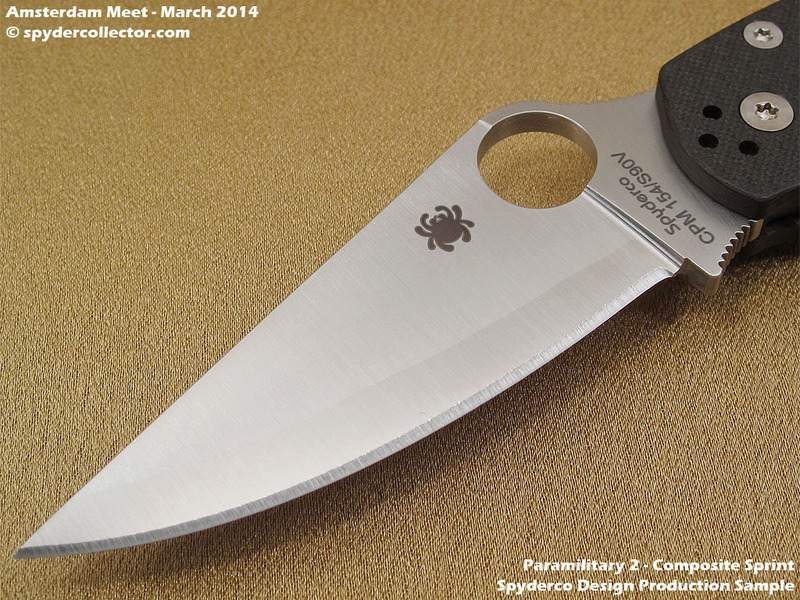 Still, Spyderco wanted to pursue this fluted handle design. So they turned to carbon fiber, hoping that that would be a lot easier to work with for -again- consistent quality and on a production scale. Unfortunately, that too proved very challenging. So much so that this particular knife, was cancelled during production and the finished fluted handles were used for the limited anniversary run of 40th anniversary natives. 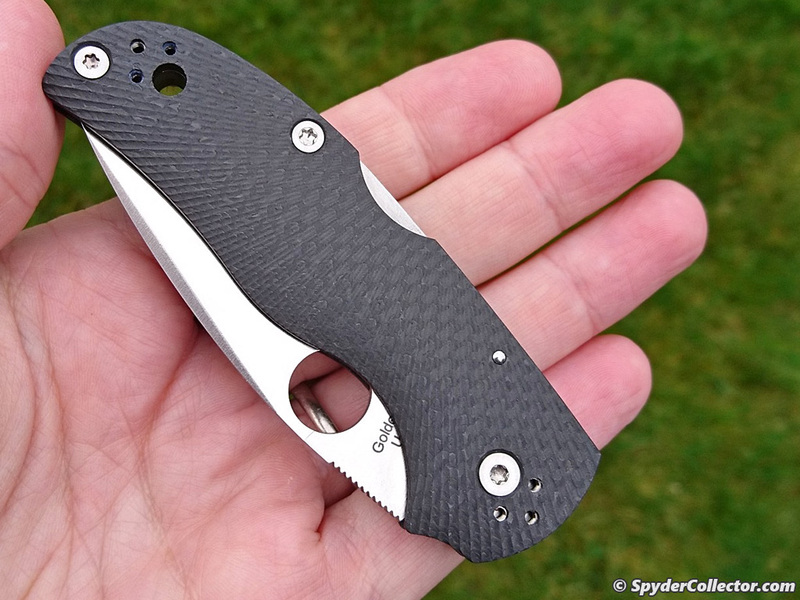 Still, Spyderco hung on and in August 2017, the C41CFF5 fluted native was released for one production run. To date, we haven’t seen any other new fluted handle designs. 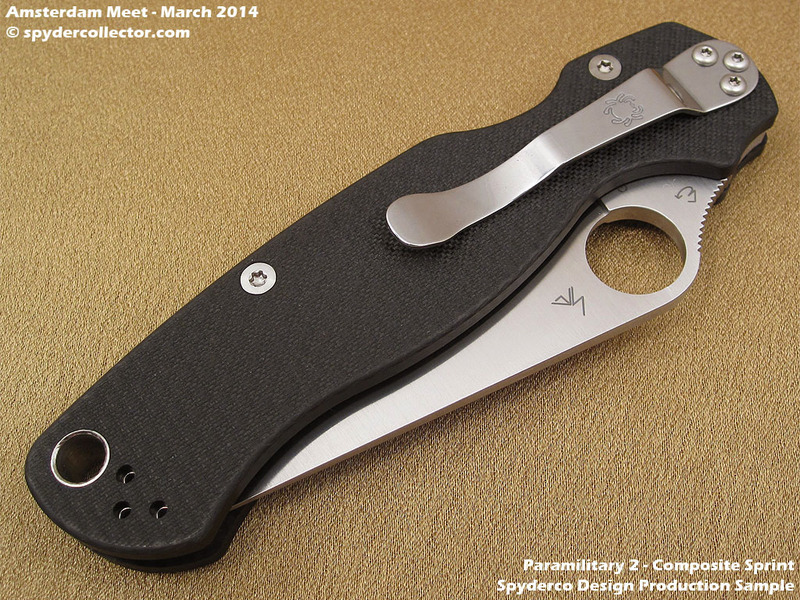 I just love Spyderco’s tenacity to keep finding a way to make the design work. I’m sure that a lots of other makers would just go with a shallow engraving of a wider stripe-pattern and call it a day. This fluting itself is plentiful, spaced very close together, deep and consistent throughout the 3D handle. The Native’s fluted carbon fiber grip is a knifeknut’s dream; the look is unique and very aesthetically pleasing and it actually works. It offers a wonderful grip, not too smooth not too rough; just right for this office worker’s dainty hands. The 3D machining fits my hand really well and the fluting adds just the right amount of traction for suburban EDC work. It’s just a plain awesome handle, and I wish we will see more knives with this handle design. But not too much, as I appreciate the fact that this is a rare and exclusive handle design. I also really appreciated the 4-way clip option. I can set it up as my left-handed utility folder and really use it. A nice touch is that the clip-screw holes feature polished steel threads sitting just a hair below the surface of the carbon fiber handle. 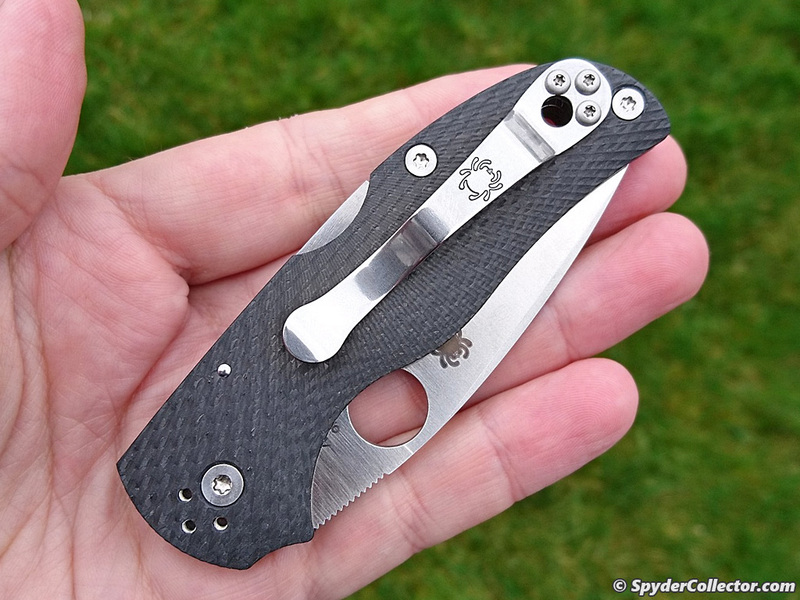 The unused clip screw holes tend to disappear from my notice, in the dark fluted carbon fiber. 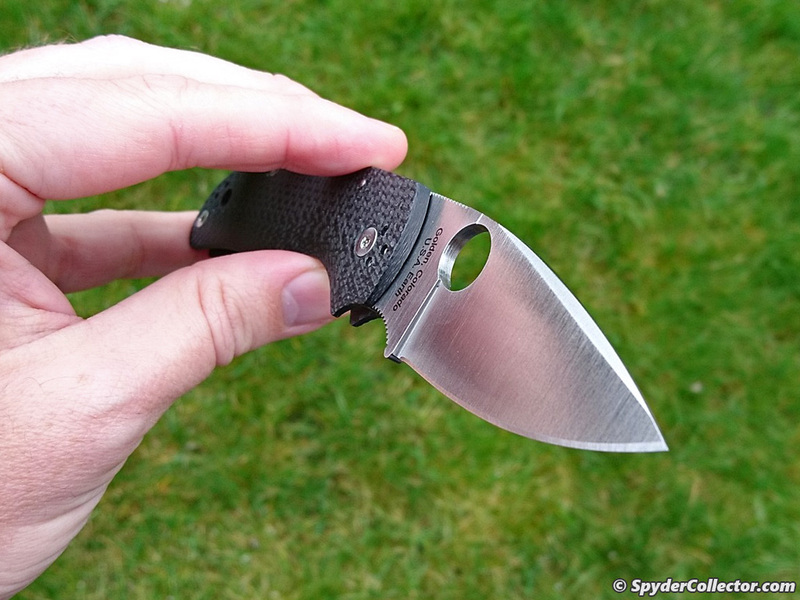 The CPM S90V blade on a Native 5 is no stranger to me, since it was also featured on the excellent 2015 forum knife. S90V ticks off all my boxes for practical EDC: it’s flat ground, around 3 inch long, leaf shaped, thin and stainless. I realize it’s not stain-proof, just stainLESS. 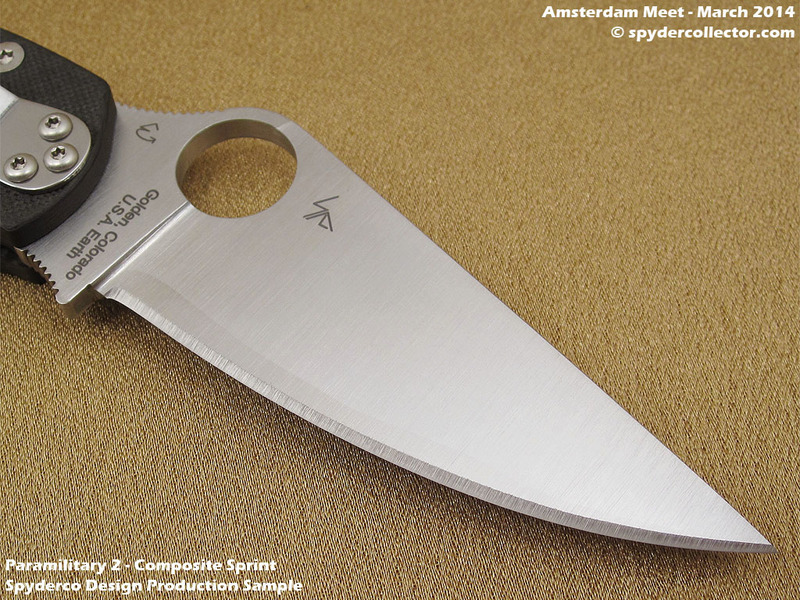 Yes, I like to play with the occasional carbon steel that Spyderco offers, but it will be cladded with a stainless steel. I just like my knives to clean up nicely after work. I know, I’m superficial, but I’m the SpyderCollector after all and collectors like to keep their precioussessss in good looking order. Edgeholding is just plain boring. Trimming some vines in the yard, opening mail, pitching in in the kitchen for food prep, cutting up apples for lunch – it all just makes that S90V yawn with boredom. All I can say is that with my mundane suburban uses, the edge holds extremely well and it doesn’t stain. The overall fit and finish is simply superb. I was actually a bit surprised about it. 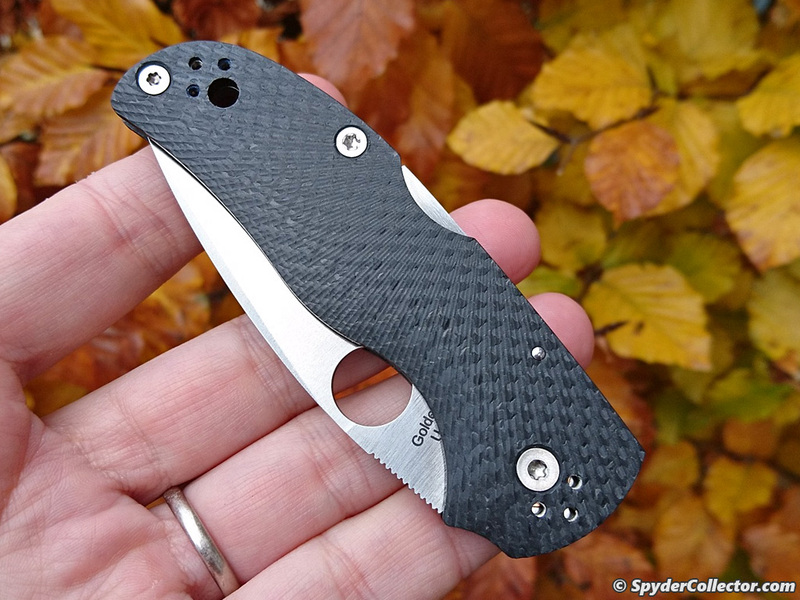 This C41CFF5’s fit and finish is just as nice as any old-school Moki made Spydie. The opening and closing action is just so smooth, and the lock-up tight as the proverbial bank vault. 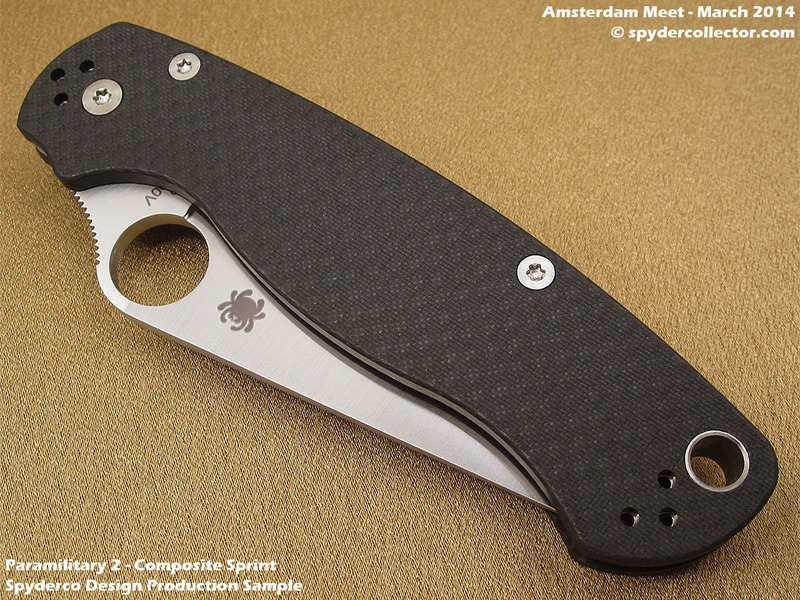 The fit and finish is on a new level for Spyderco in my book. I can feel the difference between this C41CFF5 Native and the much older G10 Native I own, which –rest assured- is just fine in the fit& finish department. 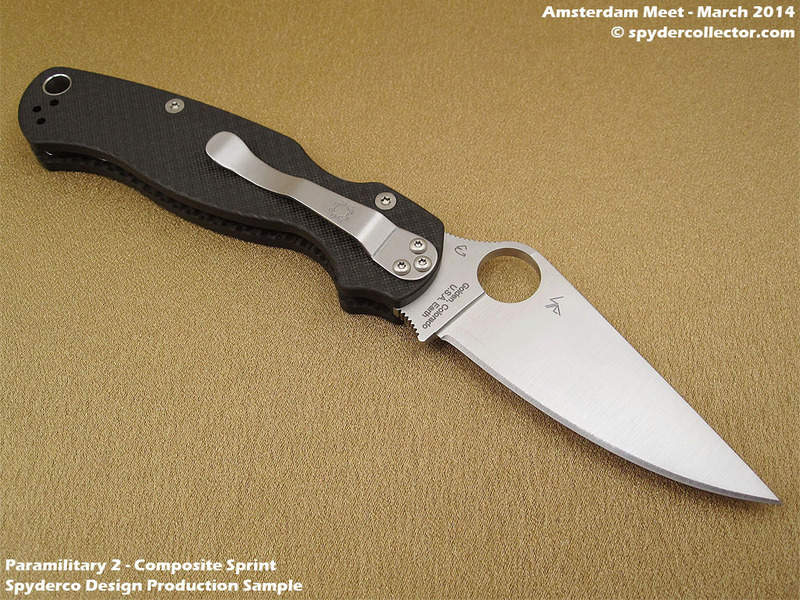 Although this very special Paramilitary 2 sprint was already shipping, Eric and Sal brought it along with them to the Amsterdam Meet. IIRC, the most important reason to try and make this CPM 154/S90v composite blade was ‘to see if it could be done’. I remember Eric explaining that this blade has no real practical benefits over a regular S90V blade. However, it was a very complicated process to successfully combine these two steels in this composite blade. Hopefully, the knowledge gained during this process for this Paramilitary 2 Sprint, will lead to other related innovations that will prove practical. 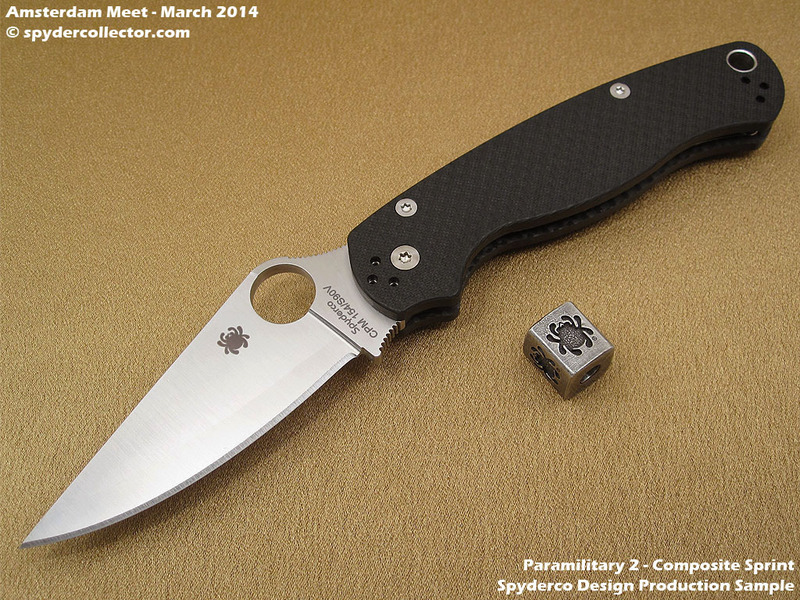 There will be more knives by Spyderco with this type of composite blade, but not in a Paramilitary 2 frame. All content Copyright © 2019 www.spydercollector.com. All rights reserved.